At the risk of stereotyping, the Chinese people are remarkably productive when given the chance. Hong Kong and Singapore are dominated by ethnic Chinese, and those jurisdictions routinely rank among the world’s top economies. Taiwan is another high-performing economy with an ethnic Chinese population. Ironically, the only place where Chinese people don’t enjoy high average incomes is China. And that’s because there’s too much statism. If you peruse the indispensable Economic Freedom of the World from Canada’s Fraser Institute, you’ll see that China is ranked #115 out of 152 jurisdictions, which is even below nations such as Greece, Haiti, and Vietnam. As I explain in this interview, China’s politicians are undermining prosperity with a system based on cronyism rather than capitalism. China’s in the news, of course, because of recent instability in its financial markets. And I’ve taken advantage of the opportunity to give my two cents on this issue (see here and here). But I was making the same criticisms even when China’s economy was perceived as a big success. I wrote in 2010 that America didn’t need to fear the supposed Chinese economic tiger. I pointed out in 2011 that China was way behind the United States. And I was at least somewhat prescient when I warned about a bubble in the Chinese economy in this 2011 debate. Though plenty of folks on the left actually argued that China’s state-controlled economy was something to mimic. Writing for Reason, Ronald Bailey cites some of their silly statements. Actually, Professor D’Aveni is right for the wrong reason. We can learn a lot from statist economies. But we should learn what to avoid, not what to copy. To conclude, this post shouldn’t be perceived as being anti-China. I want there to be more prosperity in that country, which is why I defended China from an absurd attack by the IMF. Moreover, I commend China for reforms that move policy in the right direction. 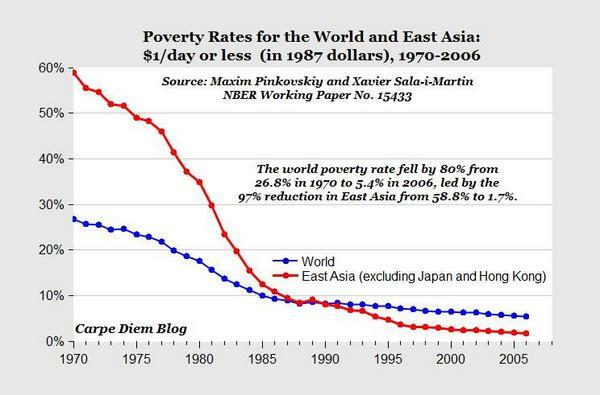 And as I pointed out in the interview embedded above, China’s reforms in the 1980s and 1990s may have been limited, but they did help lift hundreds of millions of people out of abject poverty. Since I mentioned the interview, one of the quirky parts of the discussion was whether politicians should be held criminally responsible for economic mismanagement. Here’s what I wrote a few years ago about an example of that happening in Iceland. P.S. You probably didn’t realize that it was possible to see dark humor in communist oppression. P.P.S. But at least some communists in China seem to understand that the welfare state is a very bad idea. P.P.P.S. Some business leaders say China is now more business-friendly than the United States. That’s probably not good news for America, but my goal is to have a market-friendly nation, not a business-friendly nation. Which nation is richer, Belarus or Luxembourg? If you look at total economic output, you might be tempted to say Belarus. The GDP of Belarus, after all, is almost $72 billion while Luxembourg’s GDP is less than $60 billion. But that would be a preposterous answer since there are about 9.5 million people in Belarus compared to only about 540,000 folks in Luxembourg. It should be obvious that what matters is per-capita GDP, and the residents of Luxembourg unambiguously enjoy far higher living standards than their cousins in Belarus. This seems like an elementary point, but it has to be made because there have been a bunch of misleading stories about China “overtaking” the United States in economic output. Look, for instance, at these excerpts from a Bloomberg report. China is poised to overtake the U.S. as the world’s biggest economy earlier than expected, possibly as soon as this year… The latest tally adds to the debate on how the world’s top two economic powers are progressing. Projecting growth rates from 2011 onwards suggests China’s size when measured in PPP may surpass the U.S. in 2014. There are methodological issues with PPP data, some of which are acknowledged in the data, and there’s also the challenge of whether Chinese numbers can be trusted. I’ve previously written that the Chinese tiger is more akin to a paper tiger. But Mark Perry of the American Enterprise Institute put together a chart that is far more compelling than what I wrote. He looks at the per-capita numbers and shows that China is still way behind the United States. To be blunt, Americans shouldn’t worry about the myth of Chinese economic supremacy. But that’s not the main point of today’s column. Instead, I want to call attention to Taiwan. That jurisdiction doesn’t get as much attention as Hong Kong and Singapore, but it’s one of the world’s success stories. 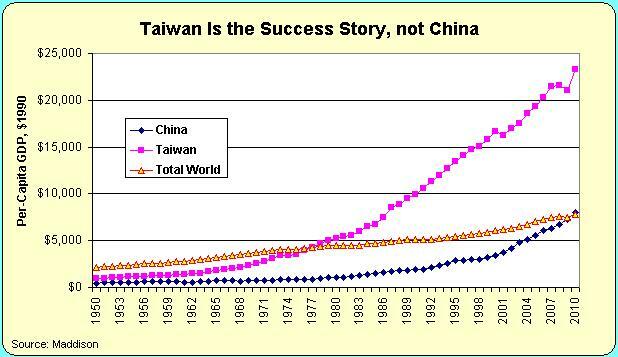 And if you compare Taiwan to China, as I’ve done in this chart, there’s no question which jurisdiction deserves praise. Yes, China has made big strides in recent decades thanks to reforms to ease the burden of government. But Taiwan is far above the world average while China has only recently reached that level (and only if you believe official Chinese numbers). So why is there a big difference between China and Taiwan? 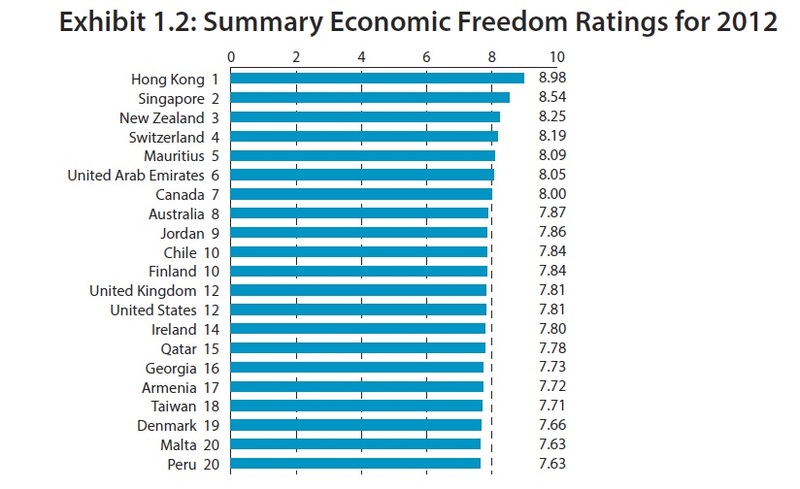 Well, if you look at Economic Freedom of the World, you’ll see that Taiwan ranks among the top-20 nations while China ranks only 123 out of 152 countries. 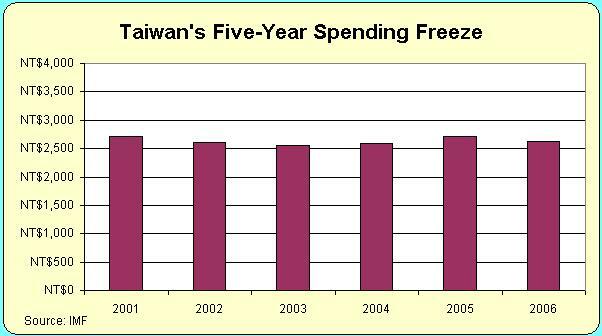 By the way, Taiwan has a relatively modest burden of government spending. The public sector only consumes about 21.5 percent of economic output. That’s very good compared to other advanced nations. Moreover, Taiwan is one of the nations that enjoyed considerable progress by adhering to Mitchell’s Golden Rule. Between 2001 and 2006, total government spending didn’t grow at all. During this period of fiscal restraint, you won’t be surprised to learn that the burden of government spending fell as a share of GDP. And it should go without saying (but I’ll say it anyhow) that because politicians addressed the underlying disease of government spending, that also enabled big progress is dealing with the symptom of government borrowing. 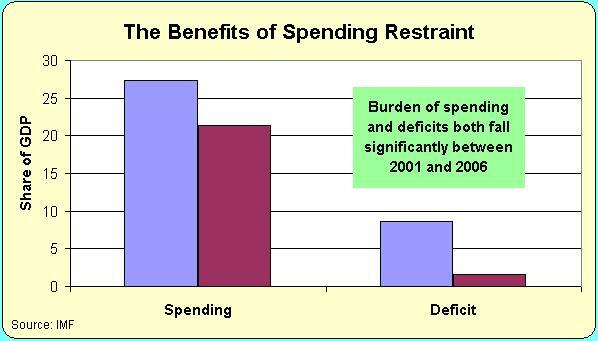 Look at what happened to spending and deficits between 2001 and 2006. The United States has the world’s worst corporate tax system, with a job-killing tax rate of about 40 percent. In the European Union, the average rate is about 25 percent, but that’s just one part of the world that is moving in the right direction. My Cato colleague recently did a blog post about Taiwan’s politicians lowering that nation’s corporate tax rate to 17 percent. Now Tax-news.com is reporting that Ukraine’s government is doing something similar, reducing the corporate tax rate from 25 percent to 17 percent. It’s worth noting that a low corporate tax rate is not a silver bullet for an economy with other bad policies. Ukraine has one of the world’s most repressive economies, so reducing the corporate tax rate is just one of many reforms that is needed. But, all other things being equal, lower tax rates always are a good idea.